What Else Can I Expect From an Online Bachelor's in Early Childhood Education Program? Early childhood education (ECE) programs cover the educational theories, methods, and tools used to teach children from preschool through second grade. ECE also covers strategies parents can use to evaluate and educate their infants and toddlers. In addition to classroom teachers, many ECE graduates become paraeducators and classroom assistants, special education specialists, childcare center employees, and child psychologists. A bachelor's degree is considered the minimum educational requirement for most ECE professionals, including preschool, kindergarten, and elementary school teachers. ECE bachelor's programs equip students with the fundamental knowledge and skills needed to lead lessons, games, and other activities for young learners. Most programs also feature required practicum components, which allow students to receive supervised training from established teachers in actual classrooms. Today, many students are choosing to earn their bachelor's in early childhood education online. Web-based programs follow the same rigorous curriculum as classroom-based options, and the flexible schedule is particularly convenient for students with jobs, childcare responsibilities, or any other commitments that make attending classes on campus difficult. Read on to learn more about what you can do with an online bachelor's degree in early childhood education, and what kind of career opportunities you can look forward to in this comprehensive guide. WHAT IS THE BEST ONLINE SCHOOL FOR EARLY CHILDHOOD EDUCATION? BestColleges.com ranks Florida International University's bachelor's in early childhood education at number one, but each school is different. Prospective students should check whether schools meet their needs and will help them achieve their goals. Read more here..
CAN YOU GET AN EARLY CHILDHOOD EDUCATION DEGREE ONLINE? Yes. 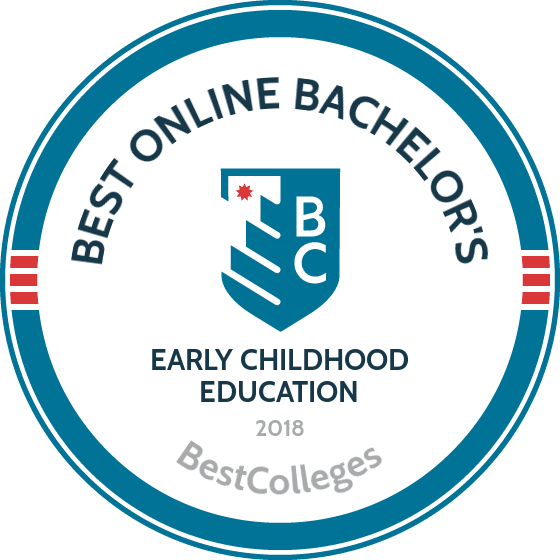 BestColleges.com ranked 25 of the best online bachelor's in early childhood education. Read more here..
After students have been admitted, they must complete all curriculum requirements, which may include a set amount of student-teaching hours or a capstone project. Most programs also require learners to maintain a minimum GPA. Read more here.. Graduates with a bachelor's in early childhood education are prepared for many careers, including kindergarten teacher, special education teacher, and preschool director. Read more here..
IS AN EARLY CHILDHOOD EDUCATION DEGREE WORTH IT? Professionals with a bachelor's in early childhood education make 29% to 32% more than those with an associate degree. A bachelor's degree also prepares learners for more careers. Read more here..
WILL AN ONLINE EARLY CHILDHOOD EDUCATION PROGRAM PROVIDE ME WITH THE SKILLS I NEED TO ADVANCE MY CAREER? ECE bachelor's programs teach students how to educate young children. Students are taught how to incorporate games, songs, art projects, and other engaging activities into their lesson plans. They also study procedures for evaluating young children in different academic arenas, and how to work with children who have learning disabilities or behavioral issues. Other areas of focus include state and federal laws governing public education, strategies for holding parent-teacher conferences, and ways to integrate disabled and gifted children into the classroom dynamic. WILL AN ONLINE EARLY CHILDHOOD EDUCATION PROGRAM WORK WITH MY SCHEDULE? Most online ECE bachelor's programs follow an asynchronous (self-paced) schedule, which allows students to access course lectures and materials, submit written assignments, take exams, and communicate with their professors on their own schedule. The latest in educational technology also allows them to study away from home using a laptop, tablet, smartphone, and other Wi-Fi-compatible devices. For additional convenience, distance learners can usually coordinate practicum courses at schools and other training sites near their residence. WHAT JOBS CAN I GET WITH MY EARLY CHILDHOOD EDUCATION DEGREE? Many ECE bachelor's program graduates pursue careers as kindergarten or elementary school teachers; however, public school teachers at all grade levels must be certified or licensed in all 50 states and the District of Columbia. Public school licensure requirements vary by state, although the criteria may include successful completion of a state-issued licensing exam, a set number of classroom-based training hours, undergraduate grade point average, or specialization in specific academic subjects. A background check is usually also required. ECE roles that may not carry licensure requirements include private school teachers, childcare center personnel, and paraeducators. WHAT ARE THE BEST ONLINE EARLY CHILDHOOD EDUCATION PROGRAMS? Choosing a program is a very personal decision, and only you can properly evaluate whether a target school's strengths match your educational needs. The following ranked list of schools should serve as a helpful starting point in your search for the best online ECE programs in the United States. If you want to pursue an ECE degree, and you value the opportunity to study online, read on to learn more about the top online early childhood education programs in the country. An early childhood education degree online program allows you to gain the education and training you need to be successful in this engaging field. There are many programs available, and most allow you to complete your bachelor's degree partially or completely online. Below is some general information on what these programs typically involve. Foundations of Early Childhood: This course provides a baseline for future coursework in early childhood education. Topics explored include historical and current best practices, the evolution of teaching methods, and the theories that drive the work of professionals in the field. Child Growth and Development: Students explore the different factors that affect young people's physical and mental development, including health, nutrition, and level of activity. Students may also discover how a child's family and community relationships impact their development. Children, Families, and Cultures: This course focuses on diversity and how families and communities of different backgrounds view early childhood education and related issues. Students explore best practices in early childhood education as they relate to multiculturalism and diversity. Early Childhood Educational Psychology: Through this early childhood education degree online course, students will learn about theories of teaching, learning, and motivation, and how they affect children's mental, emotional, physical, and socio-cultural development. HOW LONG DOES IT TAKE TO GET AN ONLINE BACHELOR'S IN EARLY CHILDHOOD EDUCATION? Most online early childhood education bachelor's degree programs can be completed in four years or fewer. Whether students attend full time or part time and when certain courses are available affect program length. Programs may differ in terms of how students move through their required coursework. Some feature a cohort learning model, which places individuals in groups with other students who all move through the program together. Other online bachelor's in early childhood education programs allow students to take courses at their own pace. Although different early childhood education online degree programs have varying requirements, most involve students successfully completing about 120 credit hours of general education and major-focused courses. Students may also need to complete a practicum, in which they work alongside a professional in a real-world classroom setting. When researching the top online colleges for early childhood education, one important consideration is the accreditation status of the program or institution. Schools should be either regionally or nationally accredited by an independent agency. Regional accreditation is considered more prestigious and comprehensive. Nationally accredited colleges may offer lower tuition rates. It's advisable to avoid programs that have not been accredited at either a regional or national level. The National Association for the Education of Young Children (NAEYC) provides accreditation specifically for online schools for early childhood education. NAEYC collaborates with the Council for the Accreditation of Educator Preparation to ensure the efficacy of bachelor's and master's programs through a comprehensive peer review program. It maintains accreditation status on 256 different institutions in 37 states and two U.S. territories. Overseeing the activities of the various accrediting agencies across the country are the U.S. Department of Education and the nonprofit Council for Higher Education Accreditation (CHEA). The Department of Education maintains stringent standards for all federally recognized accreditors, while CHEA includes more than 3,000 college and universities throughout the United States. The organization currently oversees roughly 60 recognized accrediting agencies. To find out if an early childhood education degree online program is accredited through a reputable agency, click here. ECE graduates enjoy more favorable job placement rates than students who earn degrees in other fields. A recent survey by the National Center of Education Statistics looked at the employment outcomes for 25-29-year-old college graduates in various professional fields. Using data from this survey, the following table compares the unemployment rates of education degree-holders against the rates for college graduates who have earned a bachelor's degree in other common fields of study. As the data table indicates, the unemployment rates for all three education-related majors were 1.9% to 1.5% lower than the national average. And due to the steady demand for qualified educators in public and private schools across the country, employment experts predict that unemployment rates will remain steady for ECE graduates and other professional teachers in the years to come. According to the 2015-16 PayScale College Salary Report, students who graduate with a bachelor's degree in ECE earn, on average, $30,700 as entry-level employees and $37,500 after 10 years on the job. Comparatively, those who complete their education with an associate degree in ECE earn $23,200 as entry-level employees and $28,900 after 10 years. This amounts to a wage premium of roughly 29% to 32% for ECE bachelor's-holders. Keep in mind that your salary expectations for specific positions should vary based on a number of factors, including a position's specific job title, location, and your experience. The following table looks at career growth rates for five of the most common ECE professions. Of the five occupations listed on the table, special education teachers at the preschool, kindergarten, and elementary levels saw the highest career growth, a salary increase of 37.1% between the entry-level and late-career stages. Kindergarten teachers followed closely behind with a salary growth rate of 36.8%, and ECE educators saw their earnings rise by 33.3% after 20 years on the job. Salary growth was slower for preschool personnel; preschool teachers saw their salaries grow by 13.3% over 20 years, while preschool director salaries rose 15.0% over that same time period. Students who graduate with a bachelor's degree in ECE are qualified for dozens of jobs ― including positions at public elementary schools if they have also completed their state-specific licensure requirements. Below, we covered four of the most common careers for ECE graduates. Kindergarten and Elementary School Teachers: Teachers at the kindergarten and elementary school levels focus on building core skills and knowledge in subjects like reading and writing, mathematics, science, and music. All 50 states require kindergarten and elementary teachers at public schools to obtain a teaching license or certification, and a background check is usually mandated as well. Special Education Teachers: Special education teachers teach and support students with physical or cognitive disabilities, as well as behavioral disorders. At most public schools, special education teachers lead independent classrooms where students can receive individualized attention. Special education teachers at public schools must obtain a teaching license in all 50 states. Preschool Teachers: Preschool teachers instruct children ages five and under. Since preschool is designed to prepare students for kindergarten, these teachers lead lessons involving core subjects like phonics, listening comprehension, and basic math. Preschool and Childcare Center Directors: These directors oversee teachers and other personnel who work at pre-kindergarten childcare facilities. These facilities are usually located in either public buildings or private residences. In many states, public and private childcare center directors must become certified and receive comprehensive CPR and first aid training. Many students who graduate with a bachelor's degree in early childhood education go on to pursue a master's degree in this field. For more information about opportunities for grad students, please visit our Guide to Online Early Childhood Education Master's Programs. Making professional connections and learning as much as you can about early childhood education is crucial to your success. Professional organizations offer a great entry point for students who want to learn more about their chosen career path. Below you'll find three of the country's most prominent organizations established for ECE educators. These organizations host networking events, provide online trainings, maintain active job boards, and offer other services for career-ready college graduates. National Association for the Education of Young Children: The NAEYC offers a range of supportive services for professionals who teach and assist children from birth through age eight. Member benefits include discounted books and other resources, complimentary magazine and newsletter subscriptions, and access to 'Members Only' areas of the organization's website. National Child Care Association: The NCCA is an advocacy-driven organization that fights for classroom equality, safe learning environments, and educational funding. The website features a resource library, discussion forums, and links to webinars and continuing education opportunities. Association for Early Learning Leaders: Founded in 1984, the AELL is a nonprofit organization dedicated to childcare center directors and administrators across the the globe. The website offers a job board, online training and webinar programs, continuing education courses, and other professional development opportunities.